Get a reading online from a fortune teller of your pick! You don’t need a crystal ball to see how popular fortune telling is in Korea. Just look at the number of fortune-telling cafes and stalls popping up around Seoul’s streets.Many Koreans head to a fortune teller, especially during the New Year, to ask for guidance in their career path, love life and fortune. Whether its “saju,” tarot cards, palm reading or psychics, fortune telling is booming. It’s not uncommon for a woman to seek a fortune teller’s opinion on “gunghap” or one’s compatibility with a romantic interest, or a businessman to ask if a particular investment would be good or not. While fortune telling is done all year round, the “peak” fortune-telling season is between December and February. Anxious about the future, people turn to fortune tellers around the Solar New Year (Jan. 1) or Lunar New Year (this year, “Seollal” falls on Feb. 14). For the New Year, Koreans often consult the “Tojeong bigyeol,” a traditional fortune-telling book. The book was written by Yi Ji-ham, a scholar from the Joseon Kingdom (1392-1910) and is also known as Tojeong. It continues to be used by fortune tellers in making annual horoscope forecasts based on a person’s time and date of birth. “This time of the year, people ask about their fortune for the coming year. This is called Tojeong bigyeol, which means `Secrets of Tojeong.’ Some people have specific plans for next year and ask what are the auspicious dates or locations. Young people are usually torn between studying or pursuing a career, so they ask what they should choose. Usually they want to know general information about the New Year, and specific months that are good for money, career, knowledge, health,” Janet Shin, a saju expert, told The Korea Times. Saju, or four pillars, studies a person’s life and predicts fortunes based on the four pillars: month, day, year and time of birth. Shin, who writes a weekly saju column for The Korea Times, noted that saju can help people discern aspects of their personality, find out when is the right time to do something, and discover suitable relationships. “People usually want to hear dramatic things when they get their fortune read, but saju is not like that. It is something that sheds light on our life. When it’s dark and we can’t see the road, saju can shed some light and help us find our way,” she said. Saju consultations are also popular during the New Year. The date and time of birth are converted into celestial stems and terrestrial branches, and analyzed for deeper meaning. It all sounds complicated for someone new to saju, but Shin used my own saju to explain it in simple and practical terms. Based on my saju, Shin said that 2010 will be a good year to focus on my career. There will be some changes early on, but any change will be good, she assured me. While I harbor lingering doubts as to how saju can influence my fate, Shin said the energy of the earth, sun, moon and stars at the time of birth do have an effect on the person. “These energies are translated into letters, and from these letters, we can read a fortune. I know saju is not 100 percent perfect, but there is a 10 to 20 percent range that people can change through their efforts or environment. Even people with the same saju can lead perfectly different lives,” she said. Shin also emphasized that saju is not meant to dictate one’s life path. “It gives people a chance to see what path they should take and what will make them happy,” she said, with a soft smile. 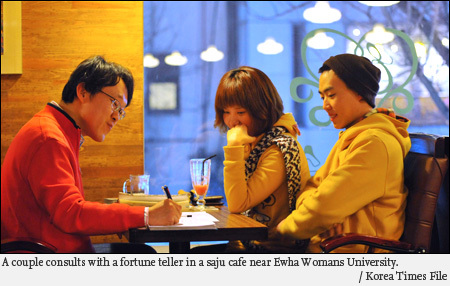 Saju consultations typically start at 30,000 won at most cafes. For more information, visit Shin’s saju column on www.koreatimes.co.kr or her Web site (http://blog.naver.com/janet_shin). Tarot cafes have mushroomed around the city in recent years, catering mostly to young women who like having their fortune told while enjoying a cup of coffee. Tarot refers to a pack of cards (usually 78 cards) that were originally used for games in Europe in the 15th century, but have been appropriated for divination by mystics. Tarot of Marseilles cards, which depict symbols such as The Lovers and The Fool, are the most often used. Modern Oracle cards that use angels and fairies have also become more widely used. At the Sharp tarot cafe in Myeongdong, tarot readings are so in demand that reservations are required ahead of time. Not surprisingly, the small cafe was filled with groups of young women eagerly hanging on to every word of the fortune tellers. Kim Bou-seong, the tarot card reader, is dressed casually in glasses and a dark brown jacket and has an unassuming demeanor. He proceeded to lay a wine-colored velvet cloth on the table, and spread out a deck of cards, asked the customer to pick three cards using the left hand. This was repeated twice again, before he lined up the cards in three rows. After unveiling each card, Kim patiently explained the meaning of the lovely cards, their relationship with one another, and how they relate to the customer’s dilemma. “I think it is important for the reader and the listener to have a kind of connection. Then it will be more effective in getting the answers they need,” Kim said. Tarot card readings are not usually taken too seriously, but are seen more as an amusing game. The Sharp cafe, which offers both tarot card and saju readings, is located in Myeongdong. To get there, get off at Myeongdong Station Line 4, Exit 5. Go straight and turn right at the first corner. Then, turn left at the first corner, and Sharp is located on the second floor above the 7-11 store. A tarot reading is 5,000 won. No English is spoken, so it would be best to bring a Korean friend to help translate. Reservations are required. Call (02) 776-1378. There’s a lot of cynicism when it comes to psychics, perhaps because there are many fake ones out there. Most do not advertise, but become well-known through personal recommendations and word-of-mouth. The House of Prediction is one of those places. Kim Hyun-jung, a trim woman in her late 40s, sat in front of a desk with a pad of paper, books, some flowers and a bowl of rice and money. A faint waft of incense was in the air, no surprise since the room is filled with shrines and statues, and even the ceiling is entirely covered with lotus lanterns. After asking for my birth details again, Kim spoke in a matter-of-fact tone about my fate this year. Change seems to be in my future, even giving specifics about what kind of changes I should prepare for. She even listed certain months that I should be extra careful with my health and personal dealings. It was quite mystifying how she could pull these predictions seemingly from thin air, and how she could speak with such authority. Her words sound reasonable enough, but maybe she just failed to convince the skeptic in me. Some believe these fortune tellers hold the answers to their problems, while others find it hard to put blind faith in predictions and cards. But there seems to be nothing wrong with taking a peek into one’s future, and finding guidance from the stars and psychics. As for the fortune tellers’ predictions for myself, let’s wait and see until the end of this year to find out if they come true or not.